Howard has greeted motorists, cyclists and walkers alike since 1998, when he was built by Ron Hale. His early career saw him as the greeter to an amusement park that Hale's family owned on the Nanoose property that is now a Chevron gas station. 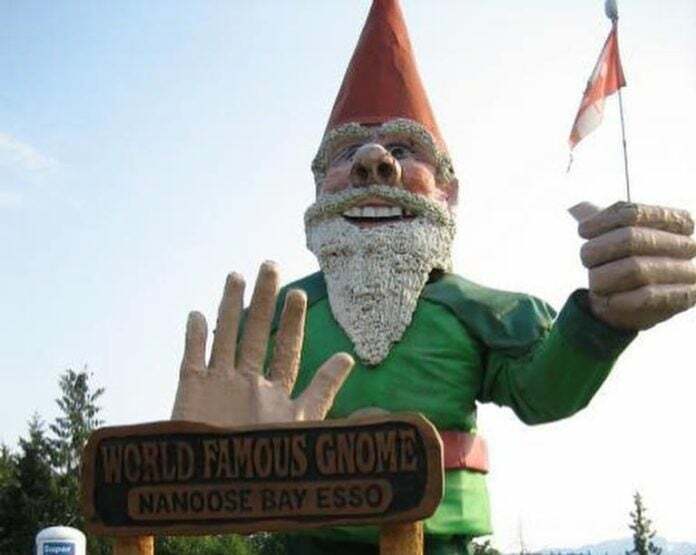 He showed up each day to his job at the park which was originally called Kiddieland, and then changed to Gnomemansland. At its peak, the amusement park saw 25,000 visitors a day. Howard never complained when visitors would gawk at his size and kept his toothy grin even as countless photos were taken by park guests. The Guiness Book of World Records recognized Howard's incredible height, which was an impressive 25 feet 11 inches, and he received the prestigious "World's Tallest Gnome" award in 2009. Howard was a beloved figure in Nanoose, except by the Regional District of Nanaimo (RDN), who cited Howard many times for breaching sign bylaws. Nonetheless, Howard continued to smile through his tears, and continued to wave at visitors and RDN bylaw officers. His structure might have been molded from foam, steel and leftover materials from a local pulp mill, but his heart was golden. The charming gnome has not had an easy life since the land he called home was sold in 2006. His once Santa-inspired white beard soon had become discolored, and it was apparent to his friends that his smile was forced and painted on. He looked disheveled and his outfit was ripped and faded. His belt, once snug, seem to hang loosely around his bright green sweater. Howard was distressed to learn that he was being evicted and needed to find a new home. Real estate reports showed a low vacancy rate on the Island, so a social media campaign was launched to find a new home for Howard. An outpouring of support for the lovable gnome ensued and he was flooded with over 120 offers. A Gofundme page was even started to raise money to help Howard get back on his feet (literally) This has now been whittled down to 5 potential locations - all of which are on Vancouver Island. The locations include 2 in Parksville and one in Coombs, Sayward and Saanich. Regardless of Howard's decision, this gentle giant of a gnome will have a happy ending to his life's story. One visitor remarked that Howard just "wanted to hang out with his gnomies" but this must be verified as he has remained silent throughout the media frenzy.